Felicity Vuolo is such a giggly girl! Jinger and Jeremy’s daughter is rarely ever seen without a smile on her face — and this video is no exception. See the happy baby here! It’s time for a new life goal — to be as happy as five-month-old Felicity Vuolo! Counting On stars Jinger Duggar, 25, and Jeremy Vuolo, 31, welcomed their baby girl back in July, and it seems like she’s been all smiles ever since. In a Jan. 6 video, the new dad confirmed that once again when he shared a Boomerang video of his daughter. “Always smiling,” he wrote. And true to form, her super cute face was split in a wide smile as she clutched a blanket and sported a floral onesie. So adorable! All we can say is, it must be tons of fun to have such a happy-go-lucky little one at home! But while many were freaking out over Felicity’s sweet temperament, it’s strange that more fans weren’t focused on the fact that her head was bare. 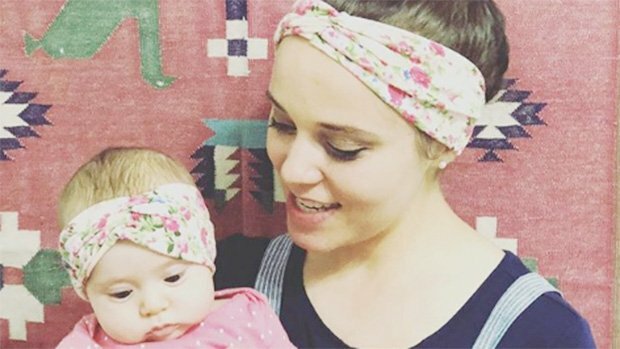 That’s because Jinger and Jeremy usually keep their daughters head covered with everything from turbans and bows to flower crowns and beanies. To see her scattering of dark hair is a rare occasion! But this video makes it clear that Felicity doesn’t need any fancy accessories to be the cutest baby on the block. She’s perfect just as she is! And when the next season of Counting On hits TLC, we’ll finally be able to see her in action. But for now, Felicity is a social media sensation! Her parents post about her all the time, and while they were met with tons of criticism at first, Instagram users have seemed to calm down. Because if they don’t have anything nice to say about Jinger and Jeremy’s outfit choices or parenting skills — or nickname choices! — they really shouldn’t say anything at all. And with such a sweet baby girl at home, they’ve got much better things to do than worry about online haters. Just look at her face!